The existence of mystery schools in the Viking Age (800-1200 CE) is deduced from myth and folklore. The poems of the Edda display the structure and content of cultic texts used within the framework of initiatic organizations. 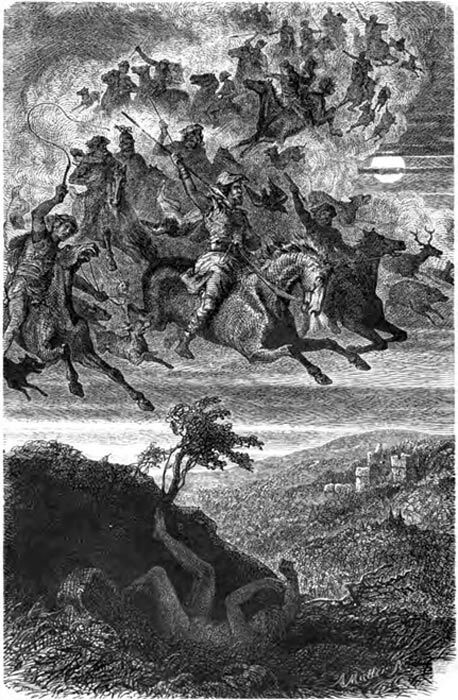 Later, in Medieval Europe, we hear about secret societies associated with the Wild Hunt, Odin, and the Einherjar. Their mysteries centered around the runes, which were already deployed magically in Ancient Germanic times (400-800 CE). The runic alphabet, or Futhark, is found in the archaeological record from the second century onwards. But its roots are far older. The Ancient Germanic rune alphabet contains keys which make it possible to trace the origins of the Northern mysteries to shortly after the last Ice Age, 11,000 years ago; more properly the Late Glacial Maximum, lasting from 13,000 to 10,000 years ago. After the glacial period, birch was the first deciduous tree to populate Europe. Its appearance coincides with the meaning and position of Berkana ‘birch twig’. The rune comes at the beginning of the third Aett; the Futhark is divided in three Aettir. The other tree species that populated Europe at that time was pine, represented by Eihwaz ‘yew’ in the runic alphabet. Norse mythology provides another clue. Ask and Embla are the names of the first man and woman, created by a triad of gods and made from wood. Askr means ‘ash’ and embla ‘elm’. The two kinds of wood form a pair since very remote times. Elm was used to make bows because the wood is flexible. Ash is used to make arrows, because the wood is very straight. Ash and elm represent bow and arrow. The weapon appeared in Northern Europe in Mesolithic times. Again, its appearance coincides with the end of the last Ice Age. Moreover, the Dutch word for elm is iep, cognate with modern English ‘yew’. Elm trees practically disappeared around 6,000 years ago, after which hunters switched to yew, equally known for its flexibility. Maybe Eihwaz originally referred to elm. Other, circumstantial, examples are Fehu and Jera. Fehu ‘cattle’ refers to the domestication of bovine creatures, circa 10,500 years ago. The Jera rune recounts a similar story. It means ‘harvest’ and refers to the cultivation of grain, domesticated around 12,000 years ago in the Levant. The history of modern humanity seemingly starts with the end of the Late Glacial Maximum. It gracefully matches to the Neolithic revolution circa 11,000 years ago. Plants and animals were domesticated; people developed a more sedentary way of life. In esoteric teaching, this era coincides with the destruction of Atlantis. According to esoteric literature, the fall of Atlantis covered a period ranging from 25,000 to 12,000 years ago. Theosophy claims that the final destruction happened at 9,564 BCE. The Atlanteans are said to have fled their sinking continents and relocated to Eurasia. According to Cayce, they fled in three migrations. Similarly, Dion Fortune explains how three migratory waves established the roots of the three great mystery currents. The first wave moved along Northern Europe into Asia. The second went more south and the third even more south, producing the mystery schools of Ancient Egypt. Steiner refers to the people of the first wave as the Hyperborean. The initiates of the first wave worked on the Astral Plane. From it developed the Northern tradition and the Celtic tradition. A close relationship consequently exists between the two. Indeed, it is clear from the historical and contemporary traditions that the two currents influenced each other – if only because of their spatial proximity. The Celtic tradition surfs on the Upper Astral level and expresses itself through Nature Worship. Beauty and art are its keywords. The tradition is associated with the faculty of imagination and the higher emotional self. Older than the Celtic tradition is the Norse. Dion Fortune calls it Nordic because the “purest contacts of this … tradition which are available to us in the West are those of the Nordic mythology”. She associates it with the Lower Astral Plane and indicates that the instincts and passions ruling this denser emotional sphere are transformed into heroic courage once sublimated. And as such do we know the gods and heroes from Norse mythology. 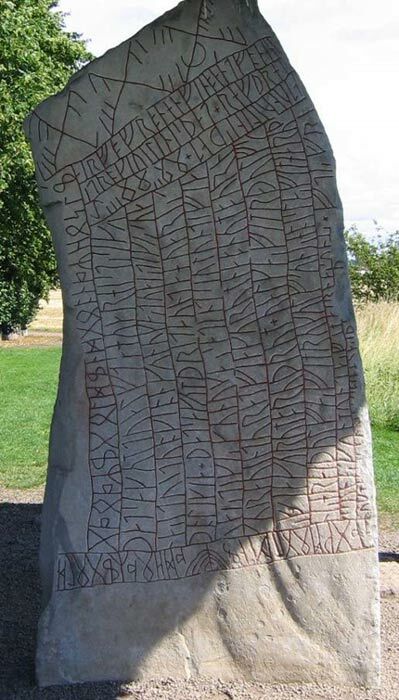 The first traceable collaboration between Germanic initiates and initiates of the Continental Celtic tradition is the invention of the runic alphabet. The main reason to presuppose reciprocity is the parallel development of the Celtic alphabet, the Ogham. I discuss the parallels in Secrets of Asgard . As example, the Futhark contains a Celtic sound not known in Germanic (P/Q) and the Ogham has one Germanic sound lacking in the Celtic language (H). This event blended the Nordic current with Celtic elements, softening it and making it compatible with the era. 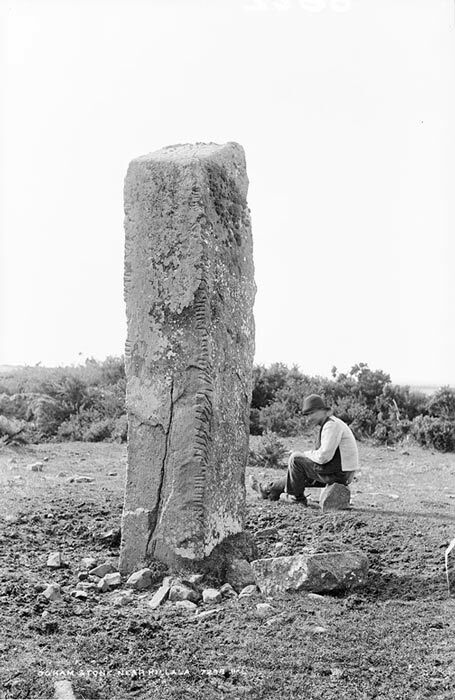 Photograph of ogham stone near Killala, Co. Mayo, Ireland. Circa 1890. Later, in the sixth or seventh century of our era, another event took place which added Celtic elements to the Nordic current. At that time, the Germanic peoples learned the art of poetry from their Celtic neighbors. The source of the Skaldic tradition comes from the Primitive Irish or Old Irish people. Firstly, the candidate had to develop practical wisdom. This is reflected by the long section of advice-giving, in, for example, Havamal. Next he was initiated. Havamal and Sigrdrifumal specify the ceremony, involving mead-drinking and marriage. The latter symbolizes the candidate’s union with the soul. Afterwards, the initiate was introduced to the runes and lastly he was taught practical magic. Men who were initiated became Odin, but banded together as Einherjar, the legendary dead. 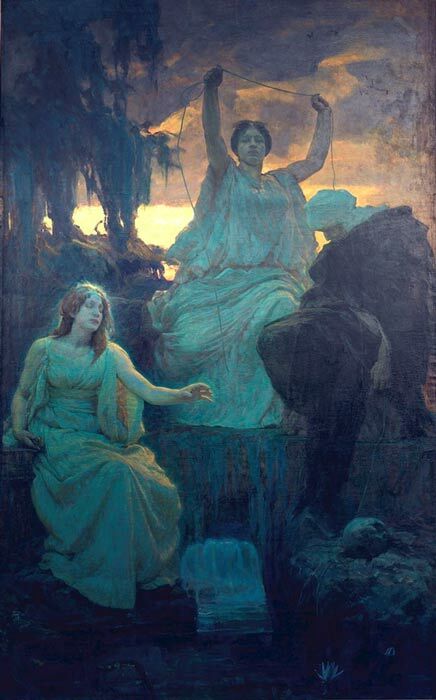 Women became first Valkyries and then völur; they were collectively known as Norns. Such secret societies are associated with the Wild Host. This army of the dead returns every autumn sweeping through the community. People in the host are dressed as the dead or as Underworld animals. Initiation into these orders implied ritual death, which is recorded in Havamal. In Christian times, the original societies were oppressed by advancing Christianity. Farwerck explains how they handed down their traditions by forming guilds. At first, the Wild Hunt fraternities formed guilds associated with individual villages. Later, they became the guilds of craftsmen and merchants. At some point, the society of builders increased in importance and formed lodges, creating the Masonic tradition. When Christianity marched over Europe, it necessarily influenced the indigenous Continental traditions. The Northern current, too, has been tinged by it and evolved into a tradition able to survive. In Scandinavian renaissance times, the Christian clergy introduced Western Occultism into heathen magical thinking and this further shaped the old currents. 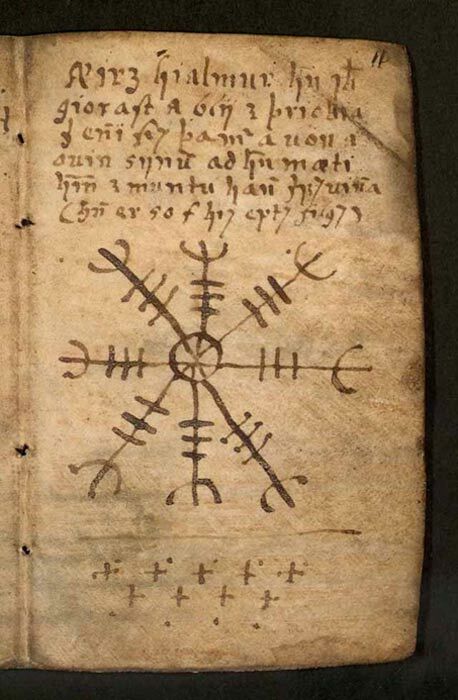 The latest expressions of this are found in the Icelandic grimoires of the seventeenth century, known as galdrabók. It later developed into the trolldom folk tradition. Some of these traditions may yet survive. Today, the Northern tradition sails on the energies of Intellectual Development; we see a very strong tendency in the modern continuation of the Northern mysteries to study and research. I believe that this intellectual approach will round out the strongly emotionally oriented energy of the original Northern mysteries schools – already smoothened by the poetic Celtic current and made gentle by the influence of Christian devotional teachings. Thor Ewing, Gods and Worshippers in the Viking and Germanic World , The History Press, Stroud 2008. F.E. Farwerck, Noord-Europese Mysteriën en hun sporen in het heden , Ankh-Hermes, Deventer 1970. Dion Fortune, Esoteric Orders and Their Work , Samuel Weiser, York Beach 2000 (original from 1928). Daan Akkerman, Atlantis en ufo’s , Uitgeverij Akasha, Eeserveen 2003. Vincent Ongkowidjojo, Secrets of Asgard , Mandrake, Oxford 2011. Vincent Ongkowidjojo, Futhark: The Celtic Link , in The Pagan Friends webzine, Yule issue 2011. Vincent Ongkowidjojo, Toverspreuken en runen , Deel 1, in De Ravenbanier 43, Viking Genootschap, Turnhout 2013. Vincent Ongkowidjojo, Doors of Valhalla , Mandrake, Oxford 2016. Marcel Otten, Edda, Ambo, Amsterdam 1994 . Rudolf Steiner, Die Mission einzelner Volksseelen – im Zusammenhang mit der germanisch-nordischen Mythologie , Rudolf Steiner Verlag, Dornach 1982 (originally from 1910). Johannes Björn Gårdbäck, Trolldom. Spells and Methods of the Norse Folk Magic Tradition , Yippie, Forestville 2015. Everyone read the secret teachings of all ages. Also the maker of the pyramid code will have huge Atlantis reveal later this year.